As early childhood development (ECD) is identified as an important target of the global development agenda, valid and reliable population-based indicators of young children’s development are needed. 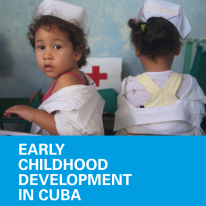 The aim of this article is to briefly summarise the current landscape of initiatives to develop cross-culturally valid and easy-to-use indicators that can be used for global monitoring and assess ECD among children from birth to 3 years of age at the population level. The foundations of adult health and well-being are built prenatally and during early childhood, when the brain develops most rapidly and both positive and negative experiences are most impactful (Shonkoff et al., 2009). Scientific advances have shown that the consequences of early adversities, such as nutritional deficiencies and excessive stress, can last throughout the lifespan and into the subsequent generation, increasing risk for chronic illness, socio- emotional challenges, and economic difficulty (Hanson et al., 2015; Johnson et al., 2016). Evidence has also demonstrated that early intervention can mitigate the effects of such adversities, enabling young children to develop resilience and experience positive developmental outcomes despite difficult circumstances (Luby et al., 2013). In response to rapidly growing evidence of the importance of ECD for health, productivity and social stability, interventions to protect, promote and support early child development are high on the political agenda in the post-2015 Sustainable Development Goal (SDG) era (Lake and Chan, 2015). 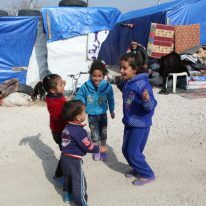 Target 4.2 of the SDGs describes ‘access to quality early childhood development’ (United Nations, 2015), while the derived Global Strategy for Women’s, Children’s, and Adolescents’ Health (2016–2030) extends an emphasis on child survival to include children’s ability to thrive (Every Woman, Every Child, 2015). To achieve the global target, population-level indicators are urgently needed to assess children’s developmental status within and across countries. The aim is to enable policymakers and programme managers to make informed decisions regarding policies and resource allocation; to evaluate the effectiveness of ECD policies and intervention efforts; and to track progress in meeting global goals and targets (Raikes et al., 2015). In this article, we outline methods that are available for the measurement of child development outcomes in young children from birth to 3 years of age individually, as well as three new approaches to developing population-level indicators for global monitoring of ECD in the same age group. Historically, multiple approaches have been used to assess young children’s developmental outcomes across diverse cultural contexts. 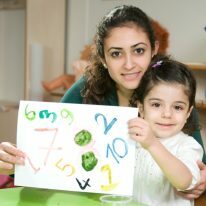 Individual-level assessments aim to quantify the developmental status of a particular child. The Bayley Scales of Infant and Toddler Development (BSID) (Bayley, 2006) and the Ages & Stages Questionnaire (Bricker et al., 1999), for example, are two screening tools originally developed in the USA that have been widely used for research in low- and middle-income countries (LMICs) (for example, Kerstjens et al., 2009; Sudfeld et al., 2015). 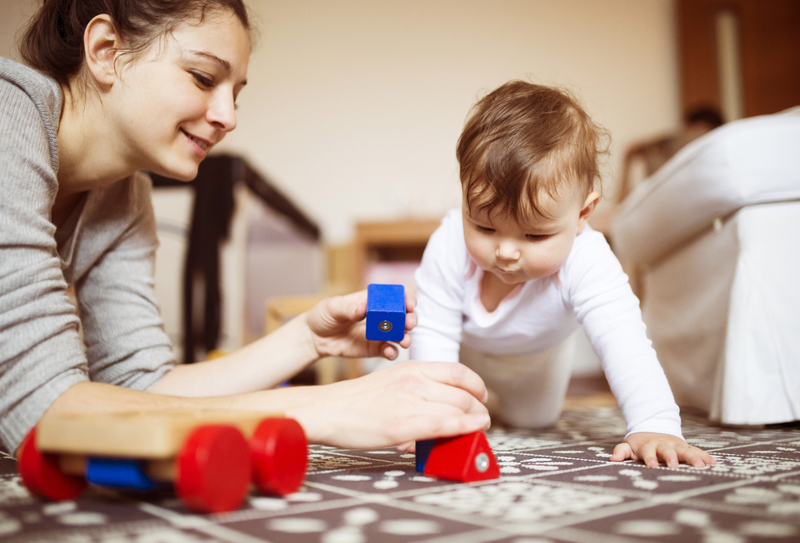 One of the major strengths of individual-level assessments is the precision with which they are able to quantify children’s developmental status, as well as their ability to provide benchmarks for ‘on-track’ versus ‘delayed’ development. At the same time, individual-level assessments require a great deal of training and time to administer, are frequently subject to restrictive copyrights, and cannot be generalised outside of the cultural settings in which they were originally developed without careful adaptation (Fernald et al., 2009; Peña, 2007; Sabanathan et al., 2015). Even with the advent of scales designed specifically for LMIC settings, such as the Malawi Developmental Assessment Tool (Gladstone et al., 2010) and the Kilifi Developmental Inventory (Abubakar et al., 2008), the scalability of these assessments for use in global monitoring is limited. Population-level assessments differ from individual-level assessment in that they are meant to measure the developmental status of a population (of a region or country, for example), rather than an individual child. 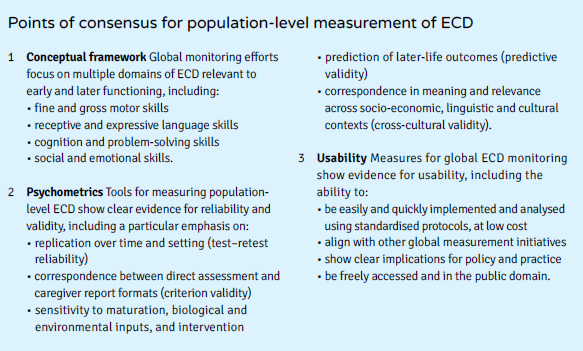 Indicators and measurement frameworks for population-level assessment are implemented at scale, and are therefore required to be easy to administer, while maintaining essential properties of reliability and validity. Universal indicators (those to be implemented globally) must also be cross-culturally and cross-linguistically comparable. Historically, population-level metrics for assessing children’s development in the period from birth to age 3 have been extremely limited. As such, policymakers and researchers have largely relied on economic and health-related proxies such as poverty, mortality, stunting, and low birthweight to estimate the well-being of their children (Grantham-McGregor et al., 2007). Although poverty and stunting meet many of the criteria for population-based indicators (Black et al., 2016, forthcoming), they are distal to many developmental outcomes and minimally responsive to programmatic interventions. "‘Indicators and measurement frameworks for population-level assessment are implemented at scale, and are therefore required to be easy to administer, while maintaining essential properties of reliability and validity.’"
"‘Historically, population-level metrics for assessing children’s development in the period from birth to age 3 have been extremely limited.’"
At least three initiatives are working with the aim to develop population-level indicators of child development in the birth to 3 years age range. Although all began with a conceptual framework and a goal to develop indicators that are both scientifically rigorous and practically useful, each initiative has taken a different – but complementary – approach to achieving this aim. metric invariance and cross-cultural validity. After a final round of pilot testing, the most robust set of items will be selected for public dissemination based on the above criteria, the results of item response theory analysis, and relevance for policy and practice. were considered feasible to undertake by caregiver report. The prototype covers fine motor skills and perception; gross motor skills; receptive and expressive language; and socio-emotional domains. Pilot testing has been intiated in three countries, to be followed by factor analysis to determine the best grouping of items per sub-scale. 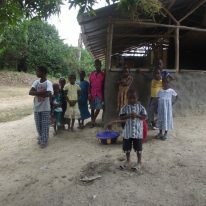 The project is being funded by Grand Challenges Canada and the Bernard van Leer Foundation. Remove or adjust items when necessary and test for differential item functioning to examine whether individual items are comparable across cohorts. Examine the predictive validity of the D-score with longitudinal data. Construct descriptive age-conditional reference charts of normal development using data from a South African birth cohort of approximately 3000 children. Determine a cut-off point for ‘off-track’ development and age-related indicators (akin to the definitions for stunting and wasting) based on psychometric properties. 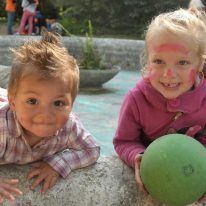 The project is funded by the Bill and Melinda Gates Foundation’s All Children Thriving initiative. 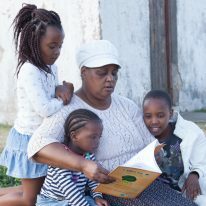 "‘At least three initiatives (each with a different – but complementary – approach) are working with the aim to develop population- level indicators of child development in the birth to 3 years age range.’"
Although distinct in origin, the approaches used by the SBECDS team, the Global Child Development Group and the WHO have converged to suggest a common framework for assessing population-level development in the birth to 3 years age range (see box). Moving forward, these teams will build on these points of commonality and work together to develop a common set of conceptually and empirically rigorous indicators for public dissemination. 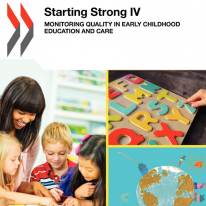 By pooling not only the data collected as part of these individual initiatives, but also the collective expertise of multiple stakeholders and institutions, the goal of this joint effort is to produce a common set of items for assessing children’s early development on a global scale. In doing so, this collaboration will provide a cohesive approach for ensuring the successful monitoring of global progress in the post-2015 international development agenda.